CS Time is a powerful and flexible time and attendance package that can be customized to your needs without compromising on ease of use. 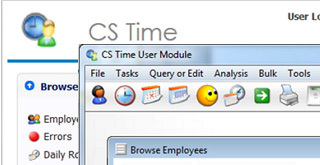 See what distinguishes CS Time from other time and attendance software. See all the latest features available when you upgrade. Easily view and manage employee hours from the desktop or web. Add, change or delete clockings and hours where required. Charge rates allows you to view the projected monetary value for the employee hours worked. Shift options include auto-deductible breaks, rounding, grace, holiday and leave hours, night shifts, automatic shift detections and rolling shifts. Shift can be customized even further using macro scripting giving you almost unlimited configurations. Draw reports on exceptions like late arrivals, absenteeism, early departures and more. Reports are customizable with CS Time´s built-in report writer. Interfaces to all recognized payroll packages. CS Time includes payroll extracts for ADP, AIM, Accsys, HR3, Quickbooks, Sage, VIP, Wage Easy and many more. CS Time automates the collection and calculation of employee payroll hours, saving you time and money. 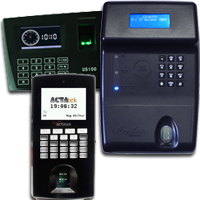 It can collect employee clocking times from multiple types of timeclocks, it can import clockings from a text file, or your employees can clock via a software program (PC Clock) or via the CS Time web interface. The web interface not only allows for the management of your employee time and attendance at remote locations - leave can be requested by employees and approved by supervisors fast and efficiently. CS Time can be used in any size business and many different industries. If you are looking to replace your manual system or your current system does not cater to all your needs, please contact one of our dealers to create your customized solution. CS Time was created in the 1990´s as TNA 2000. It has gone through six versions (TNA 2000 versions 1, 2 and 3, TNA 4, TNA5 and TNA 6), each version adding to it´s list of features. With CS Time you no longer have to pay for any future releases as it will be included in an annual licensing fee. The new features also includes automatic updates from the internet.